HIGHLY SECURE STORAGE WITH IMMEDIATE ACCESS TO CARGO CONTAINERS. 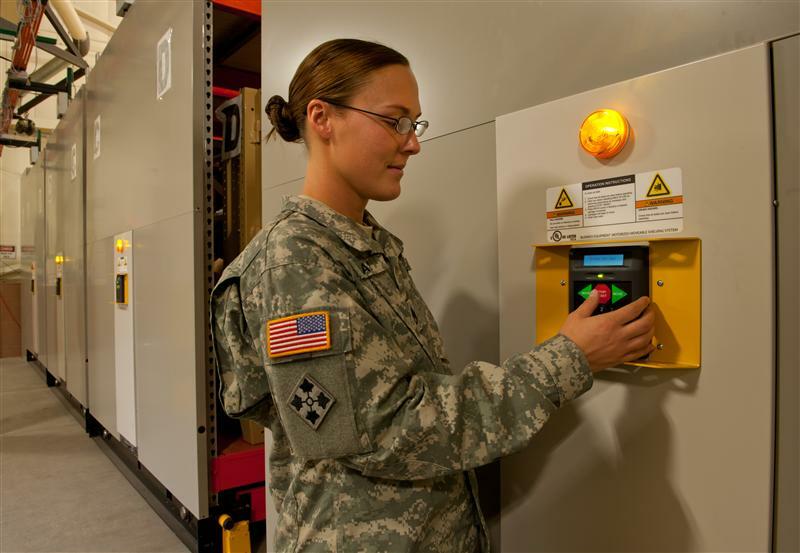 Only accessible with a pin code, the ActivRAC® system at Fort Carson helps the U.S. Army save time loading and unloading cargo materials. The ActivRAC 30P was installed at the 4th’s SSA Building at Fort Carson, CO. It mainly stores inserts for cargo containers. The containers reside just outside the building approximately 50 yards from the system. The ActivRAC system allows the group to access the materials they need immediately without having to go outside in the elements and unlock (and lock) the BOM containers each time materials are loaded or unloaded. This saves time and helps maintain organization of the unit’s materials. The system was designed with several security measures in mind, including rolling doors which need to be opened in order to access items. Several aisles are also secured with a pin code – which must be entered into the electronic pad before the aisle will open. This also provides Fort Carson with a record of who accesses the system and when.